Optimal working dilutions should be determined experimentally by the investigator. Suggested starting dilutions are as follows: WB (1:500-1:2000), ELISA (1:5000). Not yet tested in other applications. 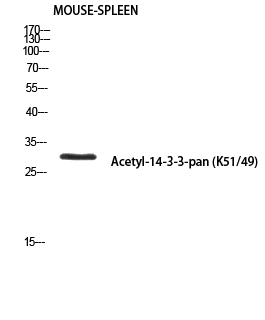 YWHAZ (tyrosine 3-monooxygenase/tryptophan 5-monooxygenase activation protein zeta) product belongs to the 14-3-3 family of proteins which mediate signal transduction by binding to phosphoserine-containing proteins. This highly conserved protein family is found in both plants and mammals, and this protein is 99% identical to the mouse, rat and sheep orthologs. The encoded protein interacts with IRS1 protein, suggesting a role in regulating insulin sensitivity. Several transcript variants that differ in the 5' UTR but that encode the same protein have been identified for YWHAZ. 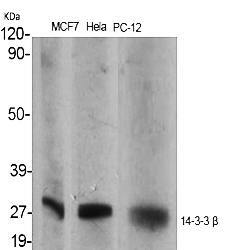 Phospho-14-3-3 β/ζ (S184/186) Polyclonal Antibody detects endogenous levels of 14-3-3 β/ζ protein only when phosphorylated at S184/186.